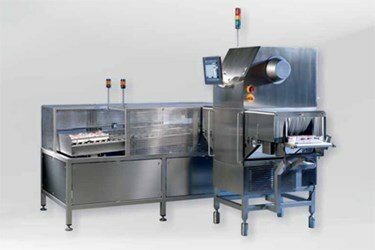 X-ray technology is becoming increasingly important in the food industry. For level and foreign objects control of their products, the Theo Müller group installed X-ray systems of the OCS Checkweighers GmbH, Kaiserslautern. This means an important contribution in terms of consumer safety. The headquarters of the Theo Müller group in Aretsried, Bavaria, dealt with the issue of X-ray technologies for a long time. The department "Central Production and Engineering" was looking for a system solution to detect foreign objects and to determine exactly the filling of their products. Back in 2007, the Müller group had invited renowned manufacturers of X-ray scanners to present their inspection systems. Extensive product testings resulted in a pre-selection of suppliers for a closer cooperation. In a way, it was decided at the last second to incorporate the X-ray scanners of OCS Checkweighers into the running selection process. The results of product tests on OCS scanners were very promising, despite their very short time on the market.